This book was really something else. You don’t find too many books that take place in Japan, and so this was a nice surprise. Also, though I read this as an ebook copy, I saw the paperback version at B&N the other week and the cover material is just gorgeous. My first thought was “recycled!”, so extra points for that. Ink was very original and very entertaining. The romance was cute and I’ll be looking forward to seeing whether it goes up or down in the next book. I loved how easy it was to connect with the main character. Katie just moved to Japan after her mom died, which I connected to because I moved to India for a year. Unfortunately, I’m going to have to admit that I didn’t take the move in stride like Katie did. I didn’t really attempt to speak the language, and I complained about almost everything, especially the weird bathrooms. Despite the fact that Katie is a much better person than me, I understood where she was coming from and admired her throughout her story. There were two possible love interests in this book: Tomohiro and Jun. Though this book hinted slightly at a love triangle, I felt that Katie pretty much stayed with Tomo the whole time. I’m glad there wasn’t a love triangle; it would have just made an already intense book too much. The cool thing about reading the novel was that whenever I started reading it, I felt like I was literally transported to Japan. It’s even cooler since I’ve never actually been there:) The descriptions and scene-setting were really well-done, and I could just see the school grounds and all the people milling around on the grass, etc etc. At one point in the book, I felt that this story was extending for way too long. When I looked at the number of pages on Goodreads though, it claimed there were only 304 pages. Then a little bit after my complaining/exhaustion, the book was finished. It turns out that there was a chapter from the next novel included at the end of this book, and let me just say, Amanda is a master at writing endings. 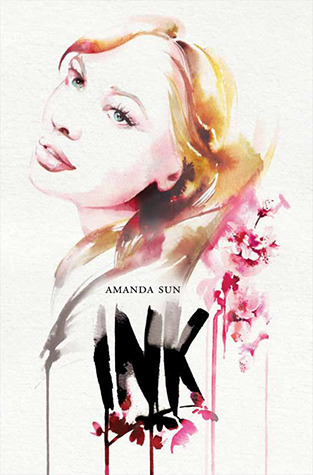 I was blown away at the ending of both the end of Ink as well as the end of the excerpt of the next book. Unlike most authors, she doesn’t leave us with a cliffhanger, but neither does she let us out of her clutches. After finishing Ink, I knew for a fact that I’d have to have the next book, Rain, as well. What hooked me the most (besides the sometimes funny Japanese romance) was the plot. Though there was only a little bit of Japanese mythology in this book, it was interesting to read about. Also, the way Katie amplified the Kami’s power, especially Tomohiro’s, added to the connection between the two characters. Overall, this book was excellently written, with a solid plot and a unique relationship between the characters. The memory I will always take with me though, is how funny it is that even on the other side of the world, boys can be just as cocky.